I know you would never think of declawing your Siberian cat. But if you do, please don’t. Declawing has been somewhat widespread in the Western world for the past few decades, and it has been quite a hot topic for reasons stated below. Despite how widespread the procedure is, many people don’t know what declawing actually is. They think it’s just like doing manicure – like clipping cat’s nails. It couldn’t be farther from the truth. Declawing is a surgery – an amputation of your cat’s last joint of the cat’s toes. To remove the claw, a surgeon or a vet will have to remove both the claw and a piece of bone that the claw is attached to, otherwise, the claw will start growing back. To do that, the vet has to cut off the tip of your cat’s toe with the bone. It’s literally like cutting off a tip of your finger. All of your fingers. For absolutely no good reason. There is a softer version of this procedure – cosmetic declawing – where, instead of cutting the tip of the cat’s toe, incision is made, cutting the toe in two, and the piece of bone is extracted from the tissue, leaving the tissue “intact”, if you can call it that way. The cat gets to keep its toe, but for the first few weeks, it will be very painful for it to walk on the cut toe until it heals. Cosmetic declawing is a more complex procedure. It takes more time, costs more and not all vets are ready to do it, so it’s usually the actual amputation that is done in most cases. No matter how you do it, it is an utterly cruel thing to do to your cat or any cat. No matter how much they scratch your sofa, or how much you love your leather chairs. Declawing is inhumane and extremely violent towards cats. 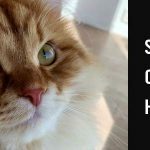 Many people feel very bad about declawing and there have been attempts to nudge the governments to ban this procedure altogether. It is enough to note that, as a surgery, it is absolutely unnecessary, not natural. It is very damaging to the cat’s anatomy. Imagine what you would feel if you had your toes amputated. You would have to learn to walk from scratch and might not be able to ever regain that ability in full. Cats don’t only need to walk. They also jump and climb things, and their last joints and claws are vitally important for those activities. You cannot tell your cat that they have to just sit in the chair all day from now on. And if you cat gets outside and is attacked, it will never be able to protect itself without claws. Apart from all of the above, this awful surgery has a very difficult, very painful recovery period. You cat will be in pain during and after surgery! After surgery, it will have to walk around on amputated toes, use its litter-box etc. It will be in pain throughout all of these activities. Also, it is extremely hard to sanitise and sterilise the cat’s toes areas after the surgery and to keep them that way. Your cat will walk on its toes, use the litter-box, etc, all with open wounds in his toes. In such circumstances, an infection is a very realistic possibility, which will bring more pain to the cat and may cause serious complications. Some of the declawing procedures are performed incorrectly and the claws grow back in altered ways, which again can cause discomfort or even abscesses. The only reason a cat should ever be declawed is if the claw is damaged beyond repair, has an infection or a tumor, and has to be removed. Just one claw! 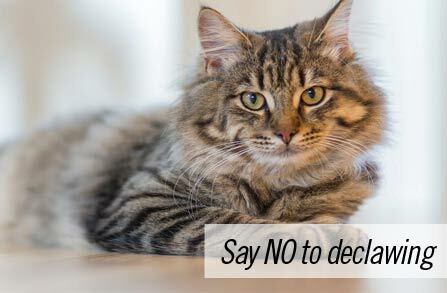 Declawing is now thankfully prohibited in many countries, such as Norway, Sweden, Denmark, England, Wales, Italy, Belgium, Slovenia, Finland, Brazil, Montenegro, Macedonia, Malta, Netherlands and many others. It is still practiced in North America! More and more vets refuse to perform this procedure by the day, and hopefully, it will be completely unlawful in the nearest future. Since you are not going to be declawing your cat (thank you! ), what can you do to prevent your kitty from destroying your valuable sofa or your beloved leather chairs? One great way to do it is to start trimming your cat’s nails. If you cut the sharp tips off, your cat will be much less able to do damage to your furniture, and will possibly have less of a desire to scratch. The best way to do this is to start trimming your cat’s nails when they are still very young. Get them used to this when they are a kitten, and they should be able to tolerate it just fine as they grow. First of all, stroke their paws when they are calm or sleeping and have them get used to the feeling of their paws being handled. Don’t try to trim their claws when they are active. Only approach them with a trimmer when they are resting, sleeping or just relaxed. Trimming your cat’s claws doesn’t hurt your cat, but isn’t a very natural feeling thing for them, so they may get spooked and try to escape, or even scratch you. If you trim their nails when they are sleeping, they will most likely not notice anything. When you trim your cat’s claws, don’t trim too much – only the tip. If you look at the cat’s claw, you will see that it has veins in the thicker part, and then nothing at the very tip. In the area where there are veins, your cat also has nerve endings, so it will hurt if you trim that part. Only trim the very tip. You should mostly concentrate on the cat’s front paws as most of the scratching damage comes from the front paws. Cats don’t scratch much with their back paws and also tend to chew the claws on their back paws themselves. Cut the nail strictly perpendicular to the direction of its growth, not across the nail, as that will cause layers to split off. Do it once every couple weeks, or when you feel that your kitty’s claws are becoming too sharp. You can find suitable nail clippers especially for cats in a pet store, or at your vet. If you are worried about clipping your cat’s nails on your own, consider asking your vet to help you. If you don’t like trimming your cat’s nails or find that it doesn’t help as much as you wanted, you can also try to use cat claw caps. Those are little caps that you can glue on your cat’s claws thus making them dull and inoffensive to furniture. All cats react differently to those, and some seem to not mind them whatsoever. However, it should only be viewed as a last resort. The best ways are still to trim your cat’s nails. 2) use cat deterrents from the surfaces that the cat actually likes to scratch, such as your sofa. There are fairly strong deterrents, the smell of which is really unpleasant for cats, so much so that your kitty will forget its way to your sofa pretty soon. (Unfortunately, those tend to smell pretty strongly to people too, so you might not be using your sofa for a while). Read more about training your Siberian cat to scratch a scratching post and not your furniture here. It’s true that having a cat in the house can be tricky if you like your furniture. Cats have natural needs and understand very little about how well this gorgeous new sofa fits in your interior, how much it cost you and how much you would like to keep it in its intact shape. They do know very well how good it will feel to give it a good scratch though! You can’t really blame your cat for that. You can, however, try to teach them good manners and avoid disasters by deactivating their weapons – trimming their claws. Just please don’t declaw, although I’m sure after what you’ve just read, you will be horrified to even think about it.